I feel it is important to have a few fun traditions for your homeschool. It gives the kids something to look forward to and be excited about! We have some "new school year" traditions, "end of school year" traditions, as well as traditions we throw in when we are feeling blah and burnout in the winter. Every school year begins with a field trip. This past year we went to Fort Ligonier near Pittsburgh, PA. Last year we went to Adventure Aquarium in New Jersey. I think it is fun to start the school year with an educational but fun field trip with the family. We don't take pictures on the first day of school, but we do take pictures on the first day of co-op! The kids have their backpacks on, water bottles in tow, and I print out or make a picture for them to hold marking the first day of co-op. Sometime near the beginning of the year we do a photo shoot outside and I conduct a back-to-school interview with the kids. This is my favorite tradition. I have been doing this since 2011 and I love going back each year and reading their responses and looking at their pictures. They grow so fast! The last day of school is marked with a trip to Rita's! We also take one final field trip to mark the end of book learning for a few weeks. This past year we went to the beach and spent a day at the Cape May Zoo where Sebastian was able to view his favorite animal: the snow leopard. Winter is a tough time to be a homeschooler. We get cabin fever. We get burnout. We get SAD because of the lack of sun. In order to combat the muck of January and February, I tend to get creative with our lessons. Sometimes we take messy art days. We get SUPER messy and just have fun being creative. We put those workbooks away and just have a fun day. Sometimes we also do a messy science experiment day. It doesn't matter- it is all learning and it is all fun. Every year in January our state has a Farm Show and we are lucky enough to live close by. We take a day or two and spend the entire day there! There are animals, learning stations, lots of tasty food, and so much to see and do. We are absolutely exhausted when we get home but we never regret it. So much fun! We also try to do plenty of field trips and activities outside of the house during the winter. Last year one of the best phys ed days was the trip to the ice rink! For New Year's we make a Time Capsule that is opened up on the next New Year. It's fun to see what we thought would be important because we always forget when we ended up putting in there over the course of the year. 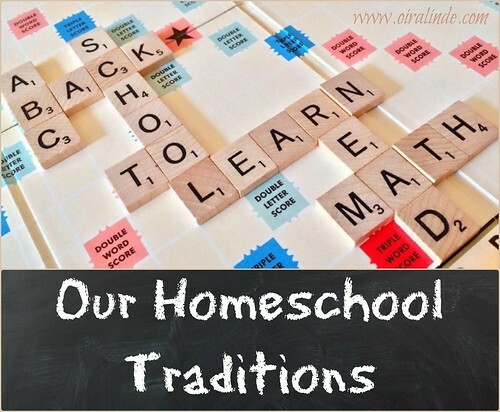 These traditions make homeschooling fun throughout the year!